After I had signed up with this web site to report my experience with Barak Lurie I waited for a week to allow Google to find my write-up and index it. I then started my search for ‘Barak Lurie‘ on Google to see how well my articles fared in relation to the information Mr. Lurie wants the internet to disseminate about him. I found my findings still only way down on page four of the results, but that was not too bad as these pages were just a few days old while the presence Mr. Lurie had created must have taken a lot more effort. But I found out something else very interesting: Barak Lurie was running for Congress[A]! I found the first sentence very interesting: “My name is Barak Lurie, and I am running for Congress. I will win.” But when I checked the current list of California representatives I could not find him. Did he make a promise that he could not keep? But I don’t want to get sidetracked, what is most important, is the fact that he wanted to be paid by the government. He wanted to get money out of the bag that is filled by the IRS. And he offered to defend me against a claim of the IRS. If that is not a conflict of interest then I don’t know what one would be. OK, he was not running for congress when I hired him, but how likely is it that somebody out of the blue decided so become a politician and run for congress? The way to congress is usually a long one with many years of working up to the nearly highest level of a political career. It might be just circumstantial evidence, but evidence nevertheless that during the time he accepted to defend me against the IRS he had already set his mind to the goal to be paid by the agency that he accepted to defend me against. This is highly unethical, to say the least! 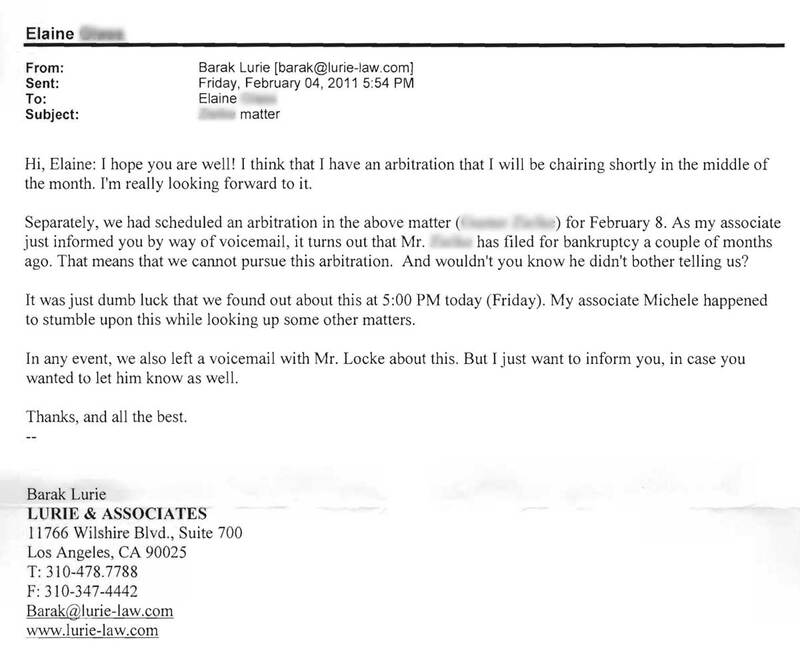 So, Barak Lurie had started the arbitration in front of the Beverly Hills Bar Association. Now some thoughts that went through my head: When I had demanded my money back he had played real hard-ball – calling it extortion and me a criminal, and that he would never give in to such a ‘vinegar’ approach. I had long worked with Japanese and I thought maybe there is something going on that can be handled with the Japanese metaphor “losing face.” Mr. Lurie could not just give in now and write a check, but if there was something external that says he should give the money back, that would be a good way out without losing face. As my intention still was just to get my money back, without any vendetta, I decided to play along. I invested the time to write my answer to his claim and mailed it into the Beverly Hills Bar Association. Wheels apparently turn slowly over there as it took weeks to get a meeting scheduled but it was finally set for February 8, 2011. I had no illusions of any unbiased arbitration in front of one or more lawyers when going against one of their peers – I played along to allow Lurie to save face and make my chances of getting my money back maybe a little bit bigger. Hi, Elaine: I hope you are well! I think that I have an arbitration that I will be chairing shortly in the middle of the month. I’m really looking forward to it. Separately, we had scheduled an arbitration in the above matter ([name withheld]) for February 8. As my associate just informed you by way of voicemail, it turns out that Mr. [name withheld] has filed for bankruptcy a couple of months ago. That means that we cannot pursue this arbitration. And wouldn’t you know he didn’t bother telling us? It was just dumb luck that we found out about this at 5:00 PM today (Friday). My associate Michele happened to stumble upon this while looking up some other matters. In any event, we also left a voicemail with Mr. Locke about this. But I just want to inform you, in case you wanted to let him know as well. Thanks, and all the best. 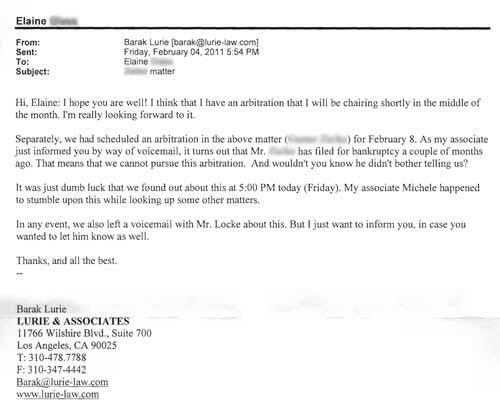 Speaking of dumb – does Mr. Lurie really think that Elaine is so dumb to believe that he runs into that information the last possible Minute to cancel that meeting without the Bar Association unable to contact me to tell me about it? He sent that email the last Minute before the weekend and is (most likely) well aware that Elaine is not in the office on Mondays and will receive that email when I am already at the office for my appointment. And what about the facts? Hey, I have filed for bankruptcy protection, but Mr. Lurie was not named as a creditor, in other words his claim was not part of the bankruptcy so his argument for canceling has no merit. Nevertheless, I now have to assume that my assessment of his motivation for starting the arbitration was wrong. Or was it just cheap revenge for me publishing these web pages? Going down to Beverly Hills today all in vain might have set me back time-wise a little bit but I learned something valuable, very well worth the time invested: this email to Elaine that I can not image Mr. Lurie would have wanted me to see. So, he is one of the arbitrators himself, so I am even more sure now that a non-lawyer would have no chances of getting a fair treatment in front of that body. That might be true also for the California Bar Association, but after being stood up intentionally I really think that I will have to file my official complaint with the Bar, something I held off for so long to allow Barak Lurie to come to his senses and just give me my money back. I guess he must be really strapped for money to take that risk. My money back is indeed all I want – no damages, no penalty, just the money I have him for something he did not do. After Barak Lurie and co-council had made no progress in solving the case but used up $15,000 in fees nevertheless and now asked for another five kilo dollars my co-defendant and I decided to look for another lawyer. Don’t know about this new lawyer’s motivation but when he looked over what had been done, he more or less said we should ask for out money back. As this only confirmed out own assessment of the situation we wrote a polite email to Mr. Lurie, asking for a return of out money. The reaction? – Nothing, nada, zilch, null! Things got exciting and hectic and we were not able to follow up on our demand. Don’t think we would have been able to take on another fight on a different front while fighting the five-hundred pound gorilla called the DOJ. But when things calmed down somewhat – they are still not over – we renewed our demand about a year later. As it was obvious, from our previous experience that Barak Lurie would not just agreed with us, we added a bit more urgency into our demand by drafting a bar complaint and told Mr. Lurie that we would go public with our experiences with him. … You should understand that your written letter (which you actually signed) constitutes extortion, a criminal offense. Posting libelous statements on the Internet would also place you in a precarious legal position. Mr. [withheld], I do not respond well to threats. Had you simply contacted me and discussed this matter, we could certainly talk. Nevertheless, your “vinegar” approach to dealing with me does not work, and I suspect does not work well with other people. I have reviewed the file and none of the accusations you make have merit. Moreover, you owe this firm more than $3300, which I have not pursued up to this point. Even if you had a viable claim for malpractice (which you do not), it has now expired. The statute of limitations for any such claim passed a year after we substituted out as counsel, and that was now over 1-1/2 years ago…. But, but, but, Mr. Lurie – we did ask kindly and you just ignored us. I suppose you knew that at that time we would not be able to pursue our demands, right? And extortion? I believe that was the chain rattling because in later communication you were educated by us that this was called a ‘settlement offer’ and dropped the pretense that you really thought that this was extortion. Otherwise most negotiations would have to be renamed extortion. As I was only interested in getting our money back, not really wanting to pursue a payment for damages, and definitely not interested in destroying his livelihood, I continued to converse with Mr. Lurie trying to reach a settlement. But instead he actually started an arbitration (which was covered in our engagement contract) to collect the amount he claimed we owed him. He had once threatened me (wonder if this extortion too) that he would start to collect this money should I dare to file my bar complaint or post anything on the internet. Sorry, but as he has now initiated the process of collecting his claim I thought that I should tell the world about my experience, exercising my first amendment rights. I don’t really understand what Mr. Lurie’s motivation here could be. I would have settled for twelve kilo dollars. Is he really that short in cash that he risks his livelihood for that small amount of money? My name is Peter Smith (changed) and I hired Barak Lurie (Facebook|LinedIn) to represent me in a case that did not appear to be too difficult as it should have been time-barred. The main issue of this case was that the government had accused me of a fraudulent transfer of real estate into a trust some eight years ago. Mr. Lurie had been recommended to me as somebody who could handle this not quite run-of-the-mill government case, and he confirmed during our first meeting that he had the expertise to handle the issues involved and told me that he was actually a specialist in fraudulent transfer cases. So I hired him and paid a retainer and shorty thereafter a second one when my co-defendant came on board as well – 10 kilo Dollars together. At that time I thought that I would get most of that money back as soon as Mr. Lurie had informed the government of its mistake. As I am reporting all this here it is obvious that it all did not turn out this way. We had to fire him another 15 thousand dollars later when it became clear that he and his two co-conspirators – Paul L. Gumina (State Bar No. 160110) and Jennifer B. Gardner (State Bar No. 128026) – were totally incapable to handle this case and actually played into the hand of the plaintiff, admitting things left and right that were not only incorrect but totally unnecessary and would have certainly made us lose the case. The following is the bar complaint that we drafted describing our accusations. The law office of Barak Lurie (sometimes hereafter “BL”) accepted representation of me, [name withheld]y, on Oct 15, 2007. Mr. Lurie, during the initial interview and in later email messages told me that he had the legal expertise to handle the complex tax and fraudulent transfer issues involved in this case. He further stated that he would use outside counsel for issues outside of areas ofsupposed expertise. On its face the case was time barred, at least for the third cause of action, which was a claim of fraudulent transfer against Alpha Beta Gamma Trust for a transfer made by me in 1998. As there is an absolute claims extinguishment period of seven years under the California UFTA, Civil Code section 3439.09, while the government did not initiate its fraudulent transfer case until nine years later in 2007, the case could have been easily won with a dispositive motion. [Footnote: The government initiated suit under the California UFTA because the statute of limitations under federal law is six years. Please see the Federal Debt Collections Procedures Act, 28 U.S.C. 3001 et seq. Please see 28 U.S.C. 3306(b). Instead of filing a dispositive motion, and performing the legal research to back such a motion, Barak Lurie instead filed a nonmeritorious motion for a more definite statement,which was not only unsuccessful, but he charged me thousands of dollars for this disservice. This motion was denied because plaintiff US Department of Justice answered all questions in the reply to the motion. In other words, the need for a motion could have easily been avoided by a few phone conversations and e-mails. BL never contacted opposing counsel regarding the sought after information before filing it, and once it was filed, plaintiff readily disclosed all information sought. Had BL merely contacted opposing counsel first, which is what any competent attorney would do, the expense of the motion could have been avoided. Of course, Barak Lurie was not looking to minimize expences. No, BL was looking for ways to come up with as many billable hours as possible in order to increase its own profits – whether or not it was in my best interests. Furthermore, Barak Lurie failed to bring up the fact that the administrative lien recorded by the government against the trust in 2003 was illegal because the procedure required by IRC 6901 had not been followed, and there is no other procedure in the IRC permitting an administrative lien to be recorded. Furthermore, BL totally missed the point that the government had sued under the California UFTA and that therefore the entire claim had been extinguished as it had not been brought within the absolute extinguishment period of seven years. Barak Lurie demonstrated total ignorance on these issues after selling himself to me as a “specialist” in fraudulent transfers and real estate law. During the time of drafting the motion for a more definite statement, the government inquired with Barak Lurie regarding another named defendant, Sunland Financial Services (“SFS”), who had the biggest stake in the case – a lien recorded in the year 2000 that, with interest, was worth approximately five hundred thousand dollars ($500,000.00), which is more than the property was worth at the time (and certainly more than it’s worth now). If that lien is upheld, then there will be no equity for plaintiff, irrespective of the timeliness of its claim. Mr. Lurie had been informed by me that I had all the contact information for this defendant. Barak Lurie acknowledged the receipt of the inquiry to the Department of Justice (“DOJ”) and answered that it would reply shortly. But BL neither responded to the inquiry of the government, nor did he inform me of the inquiry so that I could supply the requested information, which, again, I had told BL was in my possession. Because of his complete disregard of this issue, the government did not learn about the contact information of SFS, which allowed it to pursue and obtain an order for service by publication and then a default judgment against SFS. Had Barak Lurie not behaved in this negligent manner, this result would not have occurred because the government would have had to personally serve SFS. This is especially significant because, in January, 2009, Alpha Beta Gamma Trust (“ABG”) filed a bankruptcy petition. In response, the government filed a motion for relief from the automatic stay, but, because SFS is a foreign trust with a foreign address, the government was not able to property serve it, ultimately forcing the government to withdraw its motion. As the same group of DOJ attorneys is representing the government in both cases, one would reasonably conclude that this same conclusion would have been reached, and the government would have lost its case, had Barak Lurie simply given the government the contact information it requested for SFS, or at least told me that they were requesting it so that I could give it to them directly. If he had done so, and things went the way they went in the bankruptcy court, the government would have lost then as it wouldn’t have been able to bring SFS (who is first lienholder) within the jurisdiction of the court. Another problem is that, while Barak Lurie told me that he would be the lead attorney on the case, the actual attorney whom he delegated it to was Paul Gumina, whom I never had a chance to meet, much less interview, prior to BL suddenly appointing him as my attorney. I hired Barak Lurie solely because he assured me that he would be personally representing me. If he had wanted another attorney to take a leading role (or in this case,the leading role), then he had an obligation to inform me before I hired him, and not wait until after I signed the retainer agreement and paid him. In any event, Paul Gumina left the law offices of Barak Lurie after the motion for more definite statement had been filed. I did not learn about the fact of his resignation (or dismissal) until after several unanswered inquiries regarding the progress of the case to Mr. Gumina remained unanswered. This caused me extreme emotional distress as none of my e-mails came back (i.e. bounced), but two weeks passed without any kind ofresponse. Finally, I learned that a Jennifer Gardner had just been assigned to the case as the replacement for Mr. Gumina. Mr. Lurie admitted that he had “forgotten” to inform me that the attorney handling my case had left the firm. Neither had Gumina done so. While two weeks may not seem like a long time, I can assure you that, when the IRS is suing you to take away the house you live in, when the case is active, and the attorney you hire ignores you for two solid weeks, two weeks is an extremely long time. Their behavior was more than just unprofessional and negligent. It amounted to a reckless disregard of my interests as a client, causing me extreme emotional pain and suffering. Apparently the other attorney, Jennifer Gardner, was hired by Barak Lurie and spent (billed) time trying to understand the case. As it wasn’t my fault that Mr. Gumina left the firm, it was wrong of them to bill me for the time Ms. Gardner spent to get up to speed. If anything, they should have refunded or credited money to me for the time they wasted with their personnel change. In any event, BL never represented to me that he would assign the case to other attorneys, much less that he would assign it and re-assign the case at his pleasure, and charge him for the hours spent each time a new attorney was assigned. Indeed, he completely misrepresented his involvement in the case, and I only hired him based upon him telling me that he would personally represent me. He should have disclosed to me that other attorneys would be doing virtually all of the work on the case. However, this is not just an issue of assignment. An even bigger issue is the poor job Ms. Gardner did with the assignment. Her first attempt to answer the complaint was so bad and so wrong that ABG certainly would have lost the case because it played right into plaintiff’s hands. I, a non-attorney with no legal training, spotted the main errors and brought them to their attention. Barak Lurie had, due to the office’s internal friction, lost so much time that I had to constantly pester them to get the reply filed, but still the answer was filed late. ad 2. The government alleges that, “This action is being commenced… at the direction of the Attorney General of the United States and with the authorization of the Chief Counsel of the Internal Revenue Service (IRS), a delegate of the Secretary of the Treasury.” There is no reason to admit these unproven allegations. Many times government actors don’t actually comply with all the requisite formalities. We are looking to win the case any way we can, so how does it benefit me to not deny these allegations, thereby forcing the government to prove its compliance? Moreover, it’s often possible to force actual agency heads to testify when the question of their authorisation or involvement is challenged. As these references are to high-ranking officials, compelling them to testify would greatly inconvenience the government, making them more likely to settle or just lose the case. So again, what was the benefit to me in admitting their unproven allegations? ad 4. The allegation that Defendant Sunland Financial Services (“SFS”) resides in the Central District of California is categorically false, and is one of the major acts of malpractice committing by Barak Lurie in this case. I informed BL that SFS maintained its residence in Brazil (the “residence” of a trust estate being the residence of the trustee, who is currently a resident of Brazil). As SFS is in first lien position, and there is no longer enough equity to satisfy SFS’s lien, putting the government into a position where it must serve SFS in Brazil could put us into a very good position to settle the case, or even to win it. Nor is this just theory. Eventually ABG filed for bankruptcy. In response, the very same attorney representing the government filed a motion for relief from the stay. Only this time, my new attorney did object that SFS wasn’t properly served. The judge agreed and ordered personal service. After several failed attempts, the government withdrew its motion. Had BL paid heed to the information I provided to him, because the rules for service are the same in both district court and bankruptcy court, one would think that the government would be no more successful than they were in the bankruptcy case. The worst part though is that BL didn’t even try. No, BL just “admitted” that SFS is a resident of the Central District of California because of his negligent disregard for this case. ad 6. It was malpractice for Barak Lurie to simply “admit” that my wife and I owed the alleged tax liabilities. This was a major issue in the case as we had always disputed the amount of our alleged tax liabilities and claimed that the returns we filed for the years at issue, to wit, 1995 and 1996, were accurate. As the other defendants were mere transferees, no claim could be made against them, including a claim against ABG as the owner of the subject property, except to the extent that a taxliability exists against myself and/or my wife. Moreover, on my own, I was able to negotiate a settlement with the IRS reducing the tax liabilities from about $370,000@ to about $55,000. How much better could I have done with acompetent attorney who would have put the IRS to its proof, instead of just “admitt[ing]” to the tax liability that underlies this case? ad 7. What possible reason was there to not admit that SFS claims lien on the property? This is another core issue that, if resolved in SFS’s favor, would completely defeat its claim against the property as there would be no remaining equity. ad 8-9. While a denial of this allegation may be in order, it’s not because of lack of information, but rather because ABG holds title to the property. As any competent attorney would know, and especially one who represents himself as a“specialist” in real estate law, an “owner” is not the same as a “lienholder.” Barak Lurie failed to show the competence level of a first year law student! ad 12. It’s malpractice, plain and simple, for Barak Lurie to “admit” that myself and my wife have been assessed. No evidence was offered, and frequently the IRS and other agencies don’t follow their own procedures. In any event, why not put them to the proof? What benefit is derived from just conceding the issue? ad 14. The best that can be said about this paragraph of Barak Lurie’s response is that it’s poorly written, as my wife and I have consistently and strenuously maintained that we have paid all our federal tax liabilities for tax years 1995 and 1996 no later than the date that our returns for those years were filed, and that there is no outstanding balance. ad 17. This should have been an outright denial, and an obvious one for a so-called “specialist” in real estate law. The only authority of the IRS to record anadministrative lien against a transferee of a taxpayer is under IRC 6091. That section can only be imposed by issuing a notice of deficiency to the transferee which accords to the transferee the opportunity to petition the tax court, and the burden of proof on the issue of transferee liability in any such proceeding will be on the IRS. Should the IRS win the case, then it may record a lien even though there is no judicial judgment (because the tax court is an Article 1, and not an Article III, court, or in other words, it’s an administrative court). Otherwise, there is no authority for a mere revenue agent or other IRS personnel to just record a lien. This is crucial because no notice of deficiency was ever issued to either ABG or SFS in this case. A competent attorney, who is familiar with the transferee liability rules of the Internal Revenue Code, would have immediately made this objection, but not BL. The only conclusion is that Barak Lurie is not competent or not behaving competently, and either way, it’s malpractice. ad 18. In this paragraph, Barak Lurie demonstrates that he simply wasn’t paying attention to what I was telling him from day one, which is that I was never the beneficial owner of the property. Basically, I made an arrangement with [name wihheld] under which I would sign for the loan, service it in exchange for living in it (my rent), and transfer it to his trust: the Alpha Beta Gamma Trust. As this would be how the case would be presented at trial, BL was spoiling the chances of making this presentation with BL’s unqualified admission to this paragraph, where BL asserts that my wife and I were owners, when it’s our contention that we were never beneficial owners. If we were never beneficial owners, then we never transferred any equity, and so any fraudulent transfer claim – indeed, any claim against the property at all – must fail. Another problem is Barak Lurie’s affirmative defence that IRS is barred by the statute of limitations. This is not true. Had BL had even basic knowledge of federal law on this point, BL would know that, nearly 70 years ago, the supreme court exempted the federal government from state statutes of limitations in United States v. Summerlin, 310 U.S.414, 1940. However, the question has never been definitely settled about whether or not the federal government is subject to a state claims extinguishment (i.e. statute of repose)? The weight of authority and reasoning is that it is so subject, and two decisions from within the Ninth Circuit, that are precisely analogous to the facts of this case in that they both involved claims of the IRS against a delinquent taxpayer’s transferee’s real estate, so state. Those cases are U.S. v. Vellalos, 780 F.Supp. 705, D. Hawaii, 1992, and United States v. Wright, 76 AFTR2d 95-7526, 7528, 96-1 USTC ¶ 50,005, 1995. Had BL actually known anything about the applicability of state claims extinguishment provisions to the federal government, then he would have been aware of these two cases which are within the very federal circuit where BL practices. In sum, BL’s reply constitutes malpractice as it was obviously written by an attorney with no familiarity with the laws and legal principles involved in this case, and utterly unfamiliar with the factual theory of the case. Or in other words, it’s malpractice. Barak Lurie also failed to follow up on the court order for arbitration in that he failed to contact the government in accordance with the court’s order. This would have reduced this case from the initial claim of $370,000 to the current claim of $55,000 which was actually reached within two days by me personally, handling the case pro se. It was obviously not in the interest of BL to speed up the case and minimize his billable hours.